When it comes to recording vocals, it is important to get the best quality as possible taking into account the vocals are the most important track in the mix or even in a song. Aside from having a great singer to perform the tracks, it is also very important to use the correct vocal microphones. To record vocals properly in your home studio, the most recommended microphone is a condenser type microphone. The primary reason is that it has a wider frequency response, more sensitive and greater transient response which is highly needed for vocal recordings (in the next page of this article; you will know more about these differences). All beginners in recording studio do not put much importance to vocal recording quality and they opt to find a cheaper alternative by not using standard vocal condenser microphones. The reason is that they ran out of budget to buy these microphones because they are too expensive to use. In reality, you can actually buy condenser vocal microphones to be used for vocal recordings at the lowest price as possible. This makes it affordable to any home recording studio beginners. 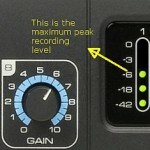 This does not mean that buying low price will compromise the quality of the recorded vocal tracks. In fact, I seriously studied a lot of vocal condenser microphones which are cheap/affordable yet having a great reputation/positive reviews among professional recording engineers and the community. You really do not need to save a thousand dollars just to buy an awesome vocal condenser microphone. 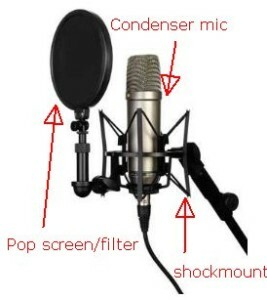 Condenser microphones are further classified into two types: large diaphragm and small Diaphragm. For vocal studio applications, it is much preferred to use large diaphragm type microphone because of its natural deep recorded sound, low noise and strong output (thus needing less gain and less pre-amp work). This is important for proper gain staging. This is a large diaphragm condenser microphone which is ideal for vocal applications. A lot of positive reviews about this microphone because of its high price to performance ratio. This another quality large diaphragm condenser microphone with price below $100. This needs phantom power of 35Volts- 52 Volts. This microphone has low noise floor and has very wide frequency response. When used with vocals, it is best to sing at least 1 feet to 2 feet away from the microphone. This microphone is voted as the best large condenser mic around $100 by studio-central.com poll. Since this is general purpose microphone, it can also be used to mike drum overheads, guitars and of course vocals. This is one of best high-value true condenser microphones on the market today. Aside from recording vocals, this microphone can also be used to record guitars. You can place this mic in front of guitar amps for example. This microphone is equipped wih FET preamplifier to give the best vocal response as possible. Since this mic is a large diaphragm; it will be able to capture low frequency response better than small diaphragm microphones. And will be able to capture vocals in a more sensitive mannel. Includes Premium Shock Mount, Pop Filter. This microphone is voted as the best all-purpose condenser microphone around $200 by Studio central forums. Condenser microphone gears: Condenser microphones require phantom power which is essentially a DC voltage that needs to power up the microphone pre-amplifier unit. The standard phantom power is +48 volts which is also supported by most mixers (provided the mixer includes phantom power features) and professional recording audio interface where you will connect these microphones. Most modern mixers even the small and inexpensive one for home studio applications such as Behringer Xenyx 502 are now equipped with a phantom power. However, the most commonly gear to power up the condenser microphone is with an external audio interface (either Firewire or USB). Modern audio interface includes a phantom power unit. So you will simply connect your condenser microphone to the audio interface and then switch on the phantom power button. If you do not have an audio interface, you should have one. You can read this post on the cheapest 24-bit/96KHz USB Audio Interface. You can also read this tips on buying an audio interface. 1.) Turn off or mute your studio monitor. 2.) Turn off or mute your audio interface. 3.) Connect your condenser microphone to the mixer microphone XLR input. See some tips here. In audio interface, you need to use the XLR output of the condenser microphone and connect it to the XLR preamp input of your audio interface. Be sure to check the impedance of your input devices (such as the audio interface) and observe proper microphone impedance matching to get the best recording signal. 5.) Turn on/switch on any phantom power switch. 6.) Turn on your studio monitor. 7.) Test your condenser microphone and adjust microphone levels.